If you haven't read any of my Distill Wars posts yet, the concept is this: I take two spirits and place them in a room with a honey badger and just one sharp stick. The honey badger gets drunk, plays with the stick like a clumsy puppy, and then passes out. It's adorable. Nah, what I do is I take two spirits, taste them and give my opinion on which one is better. 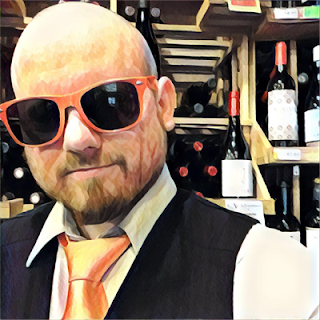 Episode I: Crap vs Cognac was Hartley's and Courvoisier, Episode II: Whisky vs Whiskey was Jameson and The Glenlivet 15, and Episode III: Ahus vs Austin was Tito's Vodka and Absolut Vodka. Episode IV takes two brands of Arak from the Holy Land and makes them face each other in a duel. 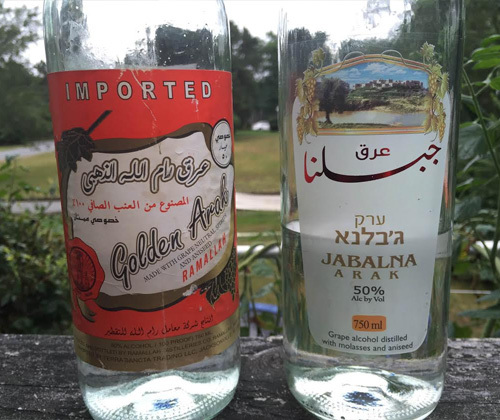 The two contestants are Ramallah Golden Arak and Jabalna Arak. As you can see from the levels in the bottles, I've already had some fun with these since I got them. But what the hell is Arak, you say? It's a grape spirit flavored with anise. Wine has to be the main source for distillation but dates, sugar, plums, figs and molasses are allowed to be part of that too depending on where it's being made. 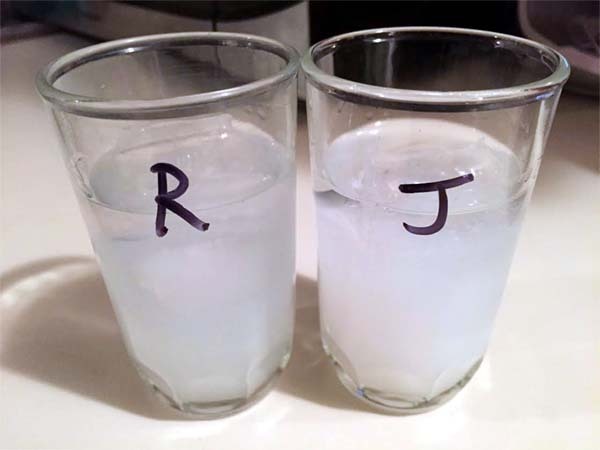 It's the Middle Eastern version of Greece's Ouzo, and its produced all over the Middle East. Lebanon, Iraq, Syria, Jordan, Palestine, Turkey, Iran and... *drumroll*... Israel. Which is where these two are from. One of the cool things about Arak is a chemical reaction called louching where the spirit turns milky white when you add water, which gives it the nickname "THE MILK OF LIONS". Cool, right? This actually happens with any spirit flavored with anise or caraway because of the oils that those ingredients impart into the spirit. Those oils are completely miscible with alcohol but water pulls the oils out and makes them visible. Boom, louching. You can watch me do it in the YouTube video for this review. 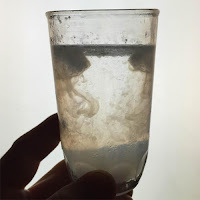 The traditional way of drinking Arak is in a small glass with ice, and you get a slow paced loaching as the melting ice dilutes it. I'll be doing all that later, but to give these a fair assessment I need to analyze them neat in a brandy snifter first. Brandy snifters are designed to trap aroma and give you the most honest assessment of a spirit's nose. The Ramallah Golden Arak goes for $20. It was bottled in Ramallah, which is in the West Bank of Israel / Palestine, by Ramallah Distilleries. That doesn't mean the grapes or aniseed are from there, though. According to the label, those are from "The Holy Land" in general. I like the old-school looking label. That definitely earns it some points. The Ramallah's got some sugar added to it because, well, the sugar crystals stuck to the neck and bottom of the bottle. As it stands during press time it's available in Florida, Alabama, Mississippi, Virginia, and Michigan. Soon it'll also be available in Illinois and California. Jabalna Arak will cost you $25. It's made in Mielya, which is a Christian Arab village in Western Galilee. But unlike Ramallah it's kosher. That's always cool because it took time out of its busy schedule to satisfy a ton of needs required by Jewish law to earn that label. The more care taken, the better the quality. Or in theory at least. Molasses was distilled with Jabalna Arak because it says so on the label: "Grape alcohol distilled with molasses and aniseed." On the legally required warning where it says that drinking while pregnant is harmful it spells "women" as "wimen". I'm sure it's an honest typo but please take the care to fix that, guys. That'll cost ya some points. Jabalna is available in Florida, Alabama and Mississippi. I live in Massachusetts so you can't find either of these here unless you have a wine blog, apparently. Both of them are 100 proof (50% ABV). This may or may not be a fun night. Both are clear but the Jabalna has the slightest, faintest, almost non-existent hint of yellow to it. So we know, this being an anise flavored spirit, that it's gonna be like drinking licorice. So instead of doing notes of each one separately I'm going to do them together on each step. On the nose the Jabalna has a big explosive kick to its anise and some citrus notes, while the Ramallah is a bit more reserved and has some earthiness to it as well. Their personalities are the same way on the palate. The Jambalna is super strong and hot with alcohol and a bit bitter on the finish while the Ramallah, still strong, has less burn and the body is rounder and kinder on the mouth. When I got these bottles I brought them into work for the boys to try. It was unanimous that Jabalna, because of its strength and power, was the better of the two. Tonight I've found Ramallah quite pleasant and romantic, though. But we're not done! 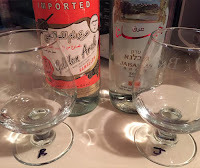 It's time to try some Arak the way it's meant to be dranked... drank... drunk... drinked? The Ramallah gets kind of briny in aroma and the Jabalna gets more candied with the licorice. On the palate the Ramallah is smooth in flavor but feels almost carbonated. The Jabalna clearly has more oils in it because it's much whiter, and the oil floats on the surface and sticks to the side of the glass above the surface. Although I've enjoyed my share of both of these the past few weeks, I hadn't sat down and compared them side by side. I wanted to save that for this review. I didn't realize how different they would be. I've got to make a decision and, although I enjoyed them both, there is one that I would take over the other. I'm assuming that somebody surrounded by Arak may find that they like the subtlety of the Ramallah better. But for somebody like myself that never has seen it until now I want as much character of the spirit as possible. Nice article. Just one factual correction: Mielya is not in the West Bank. Mielya is a Christian Arab village in Western Galilee. I apologize if it looks insensitive but it's just uninformed. I have next no zero knowledge of the region or its politics.